Made up of singer Mark Wystrach, lead guitarist Jess Carson and bass player Cameron Duddy, a trio of friends based in Dripping Springs, Texas, MIDLAND is the embodiment of Seventies California country, all smooth Eagles harmonies and heart-on-your-sleeve lyrics. Their songs are intoxicating country sung with the twang of George Strait. And it's impossible to resist. Midland — the guys took their name from a Dwight Yoakam song — excel in setting a mood, transporting the listener to another place and time. This is music made for wide-open skies, endless deserts and wondering where the road is going to take you next. Signed to Big Machine Records, Midland hit the studio refining and expanding their catalog with ace songwriters like Shane McAnally and Josh Osborne. The sessions yielded some of the most traditional-sounding country music to come out of Nashville in a decade. Lead single "Drinkin’ Problem" reached #6 on Hot Country Songs in the US and #1 in Canada. 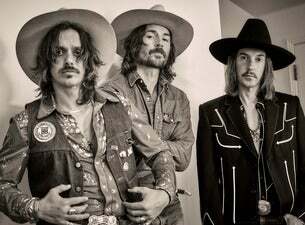 Whether they intended it or not, Midland have filled a void in country music. Like their inspirations the Eagles, they are writing and recording songs with mass appeal. "The commonality with the Eagles is that we set out to make soulful, catchy and accessible music," says Mark. "Our greatest compliment is when somebody who says they're not a country music fan says they really like our songs." But those songs succeed because of one key ingredient: the friendship of Mark, Jess and Cameron. "Midland isn't manufactured," says Cameron. "We are three real friends who stumbled upon making music together." "We are a band," adds Jess, declaratively. "That's a big part of the spirit of what we do, that group experience and camaraderie. And it is ever-evolving." Midland's music is truly a sound decades in the making that’s just right for today.